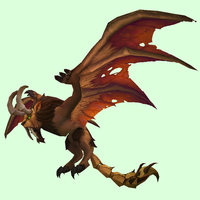 WoW Petopia Community • View topic - "Frayfeather Hippogryph Tameable for All" Hunt FOUND! "Frayfeather Hippogryph Tameable for All" Hunt FOUND! Post subject: Re: "Frayfeather Hippogryph Tameable for All" Hunt FOUND! As I said earlier, a Stagwing did react to a /roar, but only once. Why it won't again, my only guess is that it is bugged. In regards to Skystormer, it is possible that it is the tamable blue one for Alliance. But I have two qualms with that: one) it has been in the database since Legion Beta, along with a few other tamable Feathermanes that aren't in. Two) if you're going to make the pink ones tamable by Alliance, why not just do the same for the blues that are in the same area? Would be odd to have the Alliance jump through an extra hoop. Second, maybe by "dog" Muffinus was referring to Dog in the way that he responds to emotes as opposed to hippogryphs themselves being/acting like dogs. Muffinus' was definitely referencing "Dog", our MoP Farm/WoD Garrison buddy who recently was discovered to be able to join us in Legion-Dalaran. By saying "truly hippogryphs are the dog of the sky", was what flagged me to make this post. Moving Dog to Dalaran was another secret that the Discord (iirc) crew found while hunting/shortly after hunting for Riddler's Mind Worm (another Muffinus-Inspired Hunt). For those who aren't aware (since a few of my guildies weren't aware), Dog is an NPC who looks like classic Coyote model who reacts to your /love and /wave type emotes by responding things like "Dog loves you very much!" and whatnot. So the /emote on the target to get a reaction out of the hippogryphs is very similar to Dog. 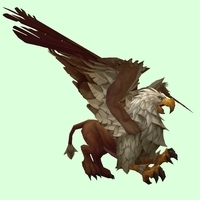 Ok so the tameable blue hippogryph for Alliance is Skystormer <The Unruly> after all! She spawned twice while I was in the area, but I'm not yet sure of the conditins required to spawn her (or it's just random). The first time I had been flying around spamming /pat and /roar at every hippogryph I could see and suddenly I noticed a neutral hippogryph on the western side of that valley that Isildien is in (on a small rise at the base of the cliffs). The second time I had mostly done only patting, but then the instant I hit /roar on a hippogryph I saw Skystormer spawn on my minimap. I've run around spamming emotes on more things with no luck so far, so it could be a coincidence or there could be a timer. She just spawned again (while I had been going around emoting at Frayfeathers) so whatever the conditions are, it doesn't take too long for her to return. It's maybe 10 minutes since she last spawned. That is very odd, but I'm glad you found it . It must be tied to the emotes, since myself and others never saw Skystormer whilst searchinf that area. If it just respawned without any conditions being fulfilled, then we would have seen it. It could've been recently activated. I know I never saw it the many times I was there, and I was using a targeting macro for it. It could go either way. I agree that it is triggered by emotes, but whether you could've gone and spawned it since 7.2 or if it was recently activated is another matter. Could be tied to a specific Hippogryph that's currently spawned. Anger it and the other one spawns? Or the title <The Unruly> might be a hint? It spawns whenever you use /roar on the native Hippogryphs. In the case of the Pink ones, they become hostile (allowing you to tame them). The means to spawn Skystormer isn't in question, but whether this method has been implemented and active since 7.2 or was recently activated. Ohhhhh, I totally misread the above parts then. My bad! Yeah it's definitely hard to say. I feel like it probably came with 7.2. While Stormfeather has been in for awhile already, I feel like they probably didn't activate it til later (much like many of the Feathermanes that arrived with 7.2 ptr) as to keep us out of the loop about our future new pet family. But they've been planning stuff pretty far in advance lately with Legion, so it makes sense that the model itself may have been pushed in a lot earlier. So, that about wraps it up for things we suspected were in-game. I think we've found them all. Well done community! What else is there that could appear in the future? 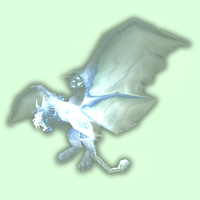 We could be pretty sure that the Spectral Wyvern will appear at some point. But at this point I don't think there are any NPCs in the database that could be hidden in the game as tameables, unless we missed one. There are also the fancy new (well, new in Pandaria) Gryphon and Wind Rider models. No tameable versions have yet appeared. I have a recollection that one or both were missing some key animations (maybe attack?). Please correct me if I'm wrong. 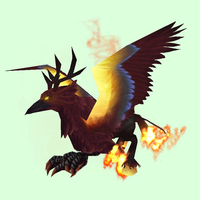 There are two flaming hippogryphs, one maroon and the other orange, both originally used for mounts. From memory, the reason these can't be used yet is that both currently exist only as mount models. However the skins for both are "natural" - they don't have harness or saddle painted on - so a flaming model could very easily be created without the saddle geoset (like the images we have up). Looking back, it's kind of a shame that the maroon one (from the TCG mount) wasn't updated to be as flaming as the orange one (which was a simple rep item) when it was created. The TCG one (which costs a lot of money) isn't nearly as flashy. Finally, there's one more new-model hippogryph skin in the database, the bright orange and green one, but it also can't be in the game yet. 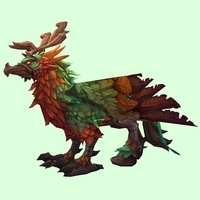 This skin was used on the RaF mount back in Pandaria (the first use of this new hippogryph) but was never copied to the new hippogryph folder. To do so would take almost no time at all and the skin fits perfectly on the new model. The weird thing is that the RaF mount and the new mount models are virtually identical, and the new non-mount model uses the exact same skin files. Like the new stags (which are virtually identical in shape to the Pandaren ones), I have no idea why they created a new model name and folder if it's identical to the original, but there you go. I would very much like the TCG one as a pet. The more flamey one, maybe not so much. Well, no, let's not kid ourselves—I've got one of each sporebat and I will probably pick up one of each hippogryph if I can fit it. I'm kind of glad the TCG mount never got "updated"—the flames on the wings of the Flameward look really awkward to me when you're flying; the Blazing has the same effect on it but since it's not on the wings it's less distracting for me. I'm so hyped for these guys! Fair enough too Aesthetics are so personal. It's just that when the the Flameward arrived the old Blazing looked a bit dim in comparison. But people prefer differing levels of flashy. I do like it, but I hope they eventually create a higher res version of the old one too. I like that style a lot. The one thing about the new one that I (and a lot of others) don't like is the how the folded wings are weirdly squared off. On such an elegant model it seemed a jarring, rough way to handle wing folding, and gives the feeling it has cardboard wings. The one thing about the new one that I (and a lot of others) don't like is the how the folded wings are weirdly squared off. On such an elegant model it seemed a jarring, rough way to handle wing folding, and gives the feeling it has cardboard wings.